Another AKC Agility trial at New Hope Farms in Port Jervis, NY, this time hosted by Monticello Kennel Club…my favorite site, 19 miles from home :-)Token & Dandy both did well, with Dandy bringing home the most ribbons. Token qualified both days in Open FAST to finish hisOpen FAST title! We had a couple of rough runs & a couple of good ones with minor errors in Open JWW & Excellent Standard. So he came home with 2 Q’s and 2 Blue ribbons. Dandy qualified in 5 out of his 6 classes, and finished 3 titles. He finished his Open Standard title with a 3rd place on Saturday (we had a wrong course, but still qualified) and made his debut in Excellent Standard on Sunday…a wrong course at a dogwalk/tunnel discrimination, but the rest was beautiful! I was already at the next obstacle by the time he finished the weaves, and also while he completed the Aframe, it was so cool to be able to handle him with the independent obstacle performance. He finished his Novice FAST title with a 2nd place on Saturday, and got his first leg in Open FAST with a 1st place on Sunday! He qualified both days in Open JWW, with a 3rd place (a refusal since I momentarily forgot the course) and a 1st place, and finished his Open JWW title! It’s tough running the two of them, I either have ring conflicts, or just a few dogs in between them…but all in all, a good weekend with a few Q’s, a few titles, and lots of fun runs. September 5-7, 2008 – New USDAA Titles! September brought us another 3-day 3-ring USDAA Agility Trial at the Blackthorne in East Durham, NY, hosted by Y Agility. Despite some heat & humidity, rain & wind, we managed to have a rather successful weekend. 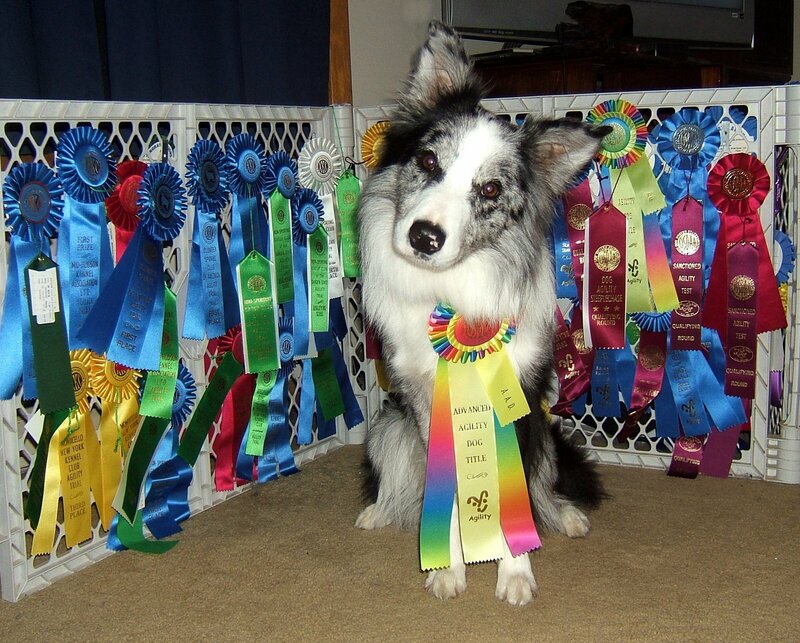 Token did some nice work in his Masters classes, though not without the usual glitches & bobbles. He did qualify in Friday’s Master Gamblers with a 3rd place. And in Sunday’s Masters Standard class, he qualified with a 2nd place in a large competive 26″ class. The 186 yard course had a standard course time of 58 seconds, and Token ran it cleanly in 41.39 seconds. This was his 5th Q in Masters Standard, finishing his SAM (Standard Agility Master) title. Dandy had a very busy weekend in the Advanced classes, and did an amazing job. He was in 4 classes on Friday, 5 on Saturday & 3 on Sunday. That’s asking alot of a young dog who just turned 22 months old today! But he rose to the occassion. We didn’t qualify in Advanced Gamblers or Jumpers due to one or two errors in each. But he qualified in both Advanced Snooker classes, earning a 1st place & a 2nd place, and finished his AS (Advanced Snooker) title. We ran Advanced Pairs with a fellow flyball enthusiast, a Dutch Shepherd named Brink, and we qualified with a 2nd place (missed 1st place by 0.03 seconds ). I entered Dandy in his first ever Grand Prix, just to see how he’d do on a more difficult course, and while he did not qualify, he only had 10 faults (missed weave entry, and one bar down). Other than those 2 errors, he ran beautifully, and I was very pleased with his run! Dandy’s big news of the weekend is that he qualified all 3 days in Advanced Standard, all First Places, to finish his AAD (Advanced Agility Dog) title! Dandy Joins Token in Masters! On Sunday, September 14, 2008, we went to a USDAA trial in Honey Brook, PA, hosted by Flexible Flyers. It turned out to be about THE hottest day of the year…in the 90’s and so humid…I no sooner got there at 7:45 am (after leaving the house at 5am) and I started to think I should have stayed home. But this was a moment in personal history…it was the first time for me running both Token and his son Dandy in Masters in USDAA. They were both entered in the 26″ class so I only had a handful of dogs in between. Token ran first so Dandy had the benefit of my working out the glitches on Token’s run. First class was Masters Standard, and it was a tough one. Again, maybe I should have stayed home There were multiple handling options in several spots on the course so I was having a tough time deciding how to handle it. Token was up first, and he really did a wonderful job…we didn’t qualify due to one refusal at a jump that I should have supported just a little bit more…but he did his job beautifully, and with 5 faults he still managed a 4th place. Several dogs later, and I’m up with Dandy. I knew what worked with Token, so I kept my plan the same except to make sure I supported that one jump enough. I also had Dandy hold his contacts and I kept the run conservative. Over the last jump, and we were clean! Dandy’s first time in Masters, and he qualified in Standard!!! I was so proud of him!!! And the icing on the cake: Dandy took 1st place in 26″! Even with our conservative approach, he was 10 seconds under standard course time. Next trial…USDAA September 27-28…I can’t wait! These two dogs are such fun to run! 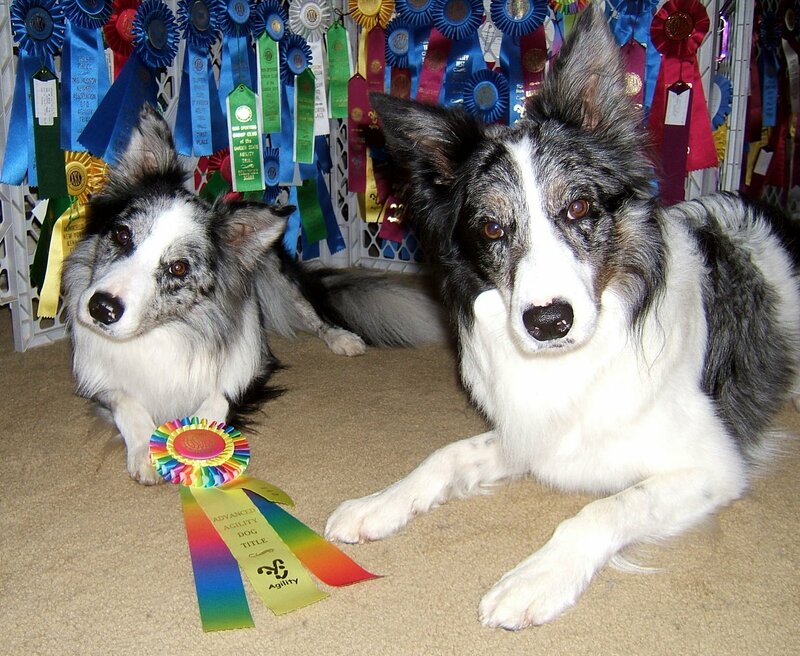 This entry was posted in Mad About BCs and tagged agility, ball-crazy dogs, border collies, dog training, flyball. Bookmark the permalink. Great fun with such wonderful dogs!! !